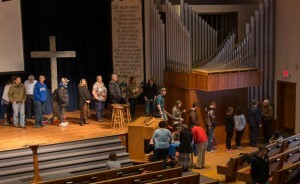 Spiritual Life Week is an annual tradition at Eastern Mennonite University – a rich diversity of opportunities for the campus community to join together in various forums to share about walking and living a life of faith. The late February event features nightly faculty/staff sharing and conversation in residence halls, special gatherings for women and men, chapel events, retreats, and the much-loved tradition of meeting in the homes of faculty and staff for a meal and fellowship. Speakers at the informal nightly discussions included Chad Gusler, professor of English, and Cyndi Gusler, professor of visual arts; head baseball coach Ben Spotts and assistant coach Adam Posey; physical education professors Roger Mast and Sandy Brownscombe; undergraduate dean Deirdre Smeltzer and Ben Bailey, office coordinator for the Applied Social Sciences Department. Professors Carl Stauffer and Carolyn Stauffer led a women’s gathering, while Wes Wilder, a ministry intern, hosted the men’s luncheon. Carmen Schrock-Hurst spoke in chapel about her years-long journey with glaucoma, a reflection titled “Walk by Faith, Not by Sight,” which was widely read and shared after posting to EMU News and Facebook accounts. Schrock-Hurst teaches youth ministry, spiritual formation, and introduction to Bible courses in the Bible and religion department, in addition to overseeing the Ministry Inquiry Program. Mike Medley, chair of the Language and Literature Department, opened Saturday evening’s meal with a smile and a Punjabi song to bless the spread of Pakistani dishes before him. He and his wife, Deb, provided curried foods including lentils, chicken, potato with cauliflower, and mustard greens. In addition, they served roti, a flour-based flatbread, achaar, mixed, pickled vegetables, and raita, a tart yogurt condiment with mint and cumin to cool down the spicy Thai dragon peppers. The dinner was typical of what he and his wife often prepare for special guests. Since a great number of EMU students study abroad, Medley thought that the ethnic food would be very much appreciated. “It’s a matter of identity,” Medley says. 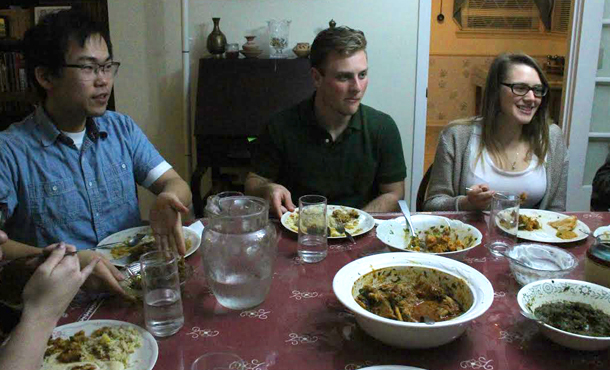 After living in Pakistan for 11 years, their lifestyle has become heavily influenced by the food and way of living. The influence of Pakistani culture is evident not only in the dishes served, but also in the artwork and ornaments that adorn their home. In the past, Spiritual Life Week has often involved bringing a well-known speaker to campus. Now those resources are focused on facilitating conversation and relationships between students and their faculty and staff counterparts. “This is what is means for faculty and staff to enter into conversation with students, and to talk about life and faith,” said Miller. Initially, when Medley received the invitation to host students as well as the indication that students wish to interact with the faculty more, he felt that it was important to open his home. 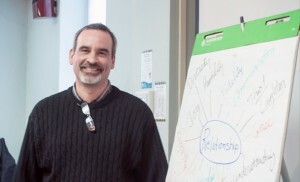 He finds that encouraging community feeling on EMU’s campus is an important part of Spiritual Life Week. In the past, the Medleys have invited students and other faculty members in his classes and within the department for dinners and occasional seasonal events. However, Spiritual Life Week has made it easier to do so because of its efficient organization. Portions of this coverage were reprinted with permission from the March 3, 2016, edition of the Weather Vane.